Abstract: Improving on the original Tundra heatsink, AVC have increased the size of the fan from 60mm to 70mm, enlarged the height of the copper fins to 28mm and added a little plastic fan guard. I always like to know something about how a heatsink is made, and the concepts behind it when I sit down at the test bench and begin evaluation. Knowing this information is something you can't just read off the box, and the extra knowledge comes in handy when trying to decipher the concepts behind the heatsinks construction. When AVC sent in their full-copper skived Tundra 2 socket A heatsink, I was pleased to see a full set of blueprints accompanying it. If you've ever wondered what a heatsinks' blueprints look like, they are basically a set of mechanical and exploded diagrams which outline each parts' shape and dimension. Since this is a full copper heatsink, we also know that the 1110 Copper alloy is 99.9% pure. But enough of that - it's the heatsinks performance we're after! 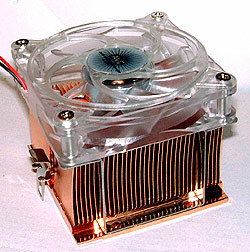 Improving on the original Tundra heatsink, AVC have increased the size of the fan from 60mm to 70mm, enlarged the height of the copper fins to 28mm and added a little plastic fan guard. The basic construction, and stiff clip have remained the same. The fan attaches to two stainless steel supports which are joined to the rest of the copper heatsink with small crimps/rivets. The stainless steel supports are geared for 70mm sized fans, and use a fine thread so if you intend on adding a thicker fan you might want to consider where to get the right sized screws first.